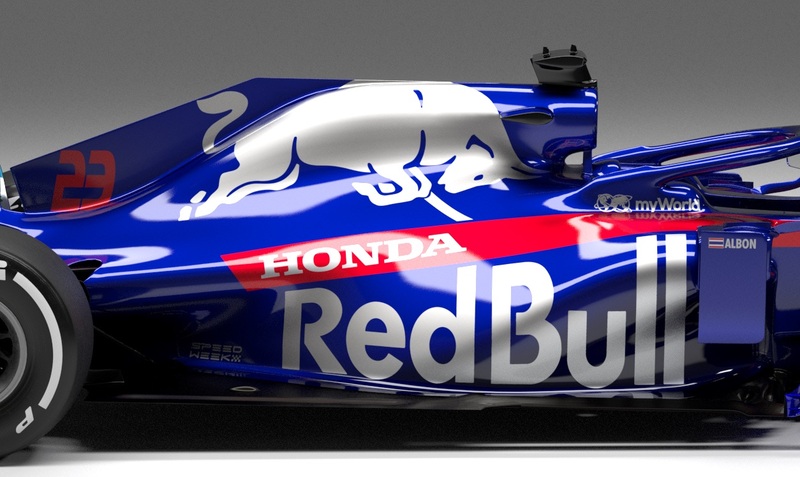 As the second team to unveil their 2019 F1 car, Scuderia Toro Rosso revealed its STR14 in an online launch today. With a continuation of the Honda relationship and a tighter technical partnership with Red Bull Technology, this is a big step for the Italian team. Its new car diverges from its forebear with both new solutions and adaptations to the new rules. 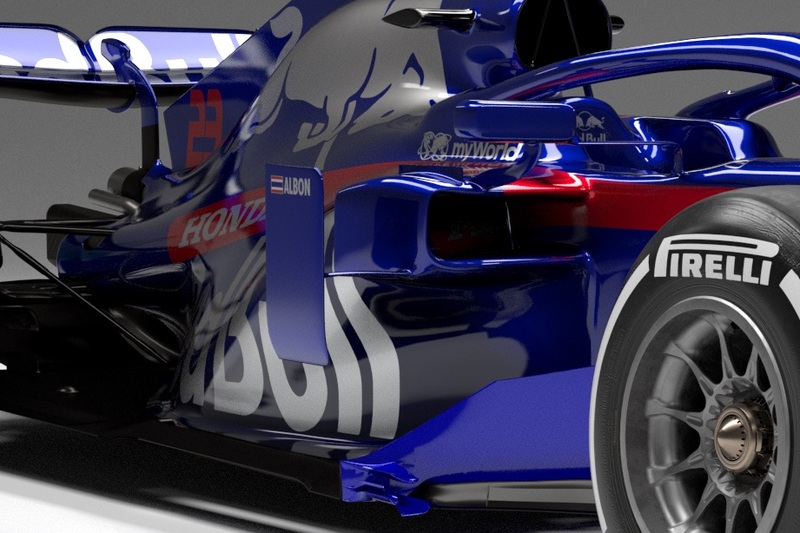 Like Haas, Toro Rosso also only showed digital renders of their new car. Despite the uncertainty of this format, we can still learn a lot about the STR14 from what’s been released so far. Times are changing at the Faenza based team, despite often being seen as a Red Bull customer team, they have in fact been staunchly independent in design terms. In their 14 years, the team built up a design office that only was only provided with the power unit and gear cluster from its parent team, the rest of the car being wholly designed at the Toro Rosso HQ and in its UK based Wind Tunnel in Brackley. However, with the success of Haas and its ‘listed parts’ approach to the design of the car, Toro Rosso are also heading in this direction. For 2019, Toro Rosso are not going to the full Haas model, but are taking the full Red Bull rear end, thus the Honda Power Unit, the full Red Bull gearbox and case, plus the rear suspension. This allows the team to focus on the rest of the car, in particular the aero, front suspension and power unit integration. 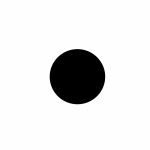 As mentioned above, these images are digital renders not a physical car, so we have to be careful with making assumptions on what might be false or missing parts. The real car will be seen for the first time at the opening test in Barcelona next week. The first example of the lack of real detail on the images is the front wing. This is clearly a Version 1.0 front wing, meeting the new dimensional and complexity rules, so its general shape is about right for a wing that will be fitted for the start of testing. But, the lack of any other hardware fitted to the wing; slot gap separators, flap adjusters, etc shows that this a simplified wing and not much can be learnt from analyzing this too deeply. Likewise, the nose is not a fixed part of the chassis, so it might change, especially as it appears to be very much the 2018 spec with its; thumb tip, louvered mounting pylons and S-Duct. Moving back towards the rest of the car’s front end, more substantial changes are visible and ones that are likely to be accurately depicted on the images and embedded into the car’s design, thus not easily changed through testing or at the first races. This starts with the front of the monocoque, the sloped front section is made more dramatic by the hump formed over the front suspension rockers. This follows Force India’s shaping in this area last year. 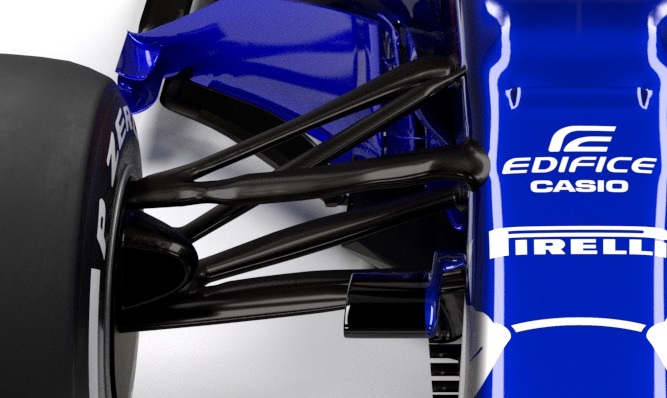 Equally, the front suspension geometry is very different from the STR13. 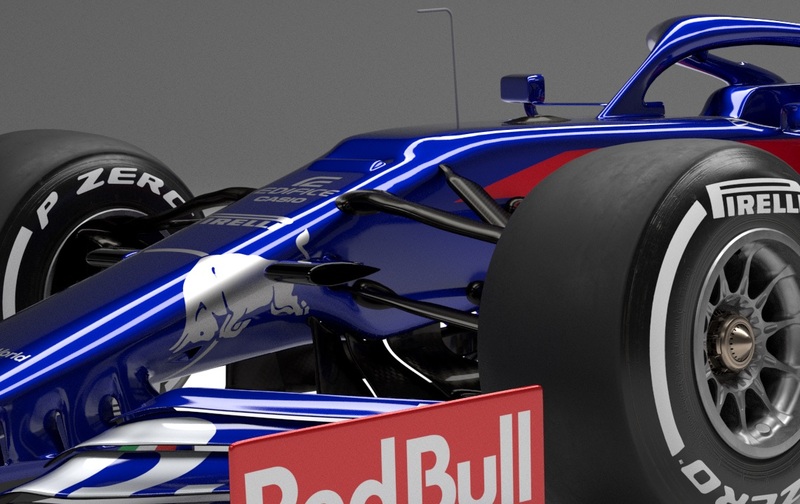 Last season the STR13 had high mounted front wishbones, this was an aero solution that raised both wishbones higher up on the chassis, which required a high mounting at the wheel to keep the correct geometry – formed of a metal arm extending up from the front upright and emerging put of the brake duct to meet the upper wishbone. Now, the car sports more conventional suspension with the wishbones passing through the brake duct to an upright that fits completely within the wheel. The switch back to more conventional wishbones and upright, could be for two reasons; firstly aerodynamic, it’s often suggested that these raised wishbones won’t work with the new sidepod format sported further down the car. 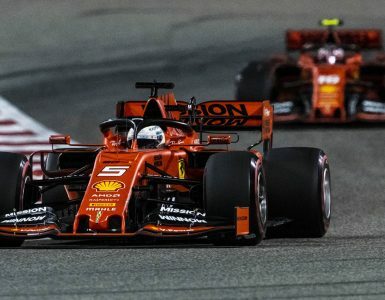 The other reason could be tyre management, with the thin-gauge 2019 Pirellis and wider variation in compounds, better control of the front tyre contact patch could be critical in having pace throughout the GP weekend. Also, worth noting around the front suspension is the front brake ducts and axles, which are much simpler due to the new regulations cleaning up the inner brake duct and closing the blown open axle. It’s around the mid-section of the car, that the car has been changed the most to suit the aerodynamics. Despite bargeboards that are clearly to short for the new regulations, these parts can’t be considered as completed 2019 parts. However, it’s the sidepods that show the key concept change for the team in 2019. This involves a move towards the high-top sidepod solution, pioneered by Ferrari in 2017, although the detail differs considerably. The idea for this sidepod design is to raise the inlet in order to create a deeper undercut below it. This directs more airflow down around the sidepod to create more pressure over the diffuser. 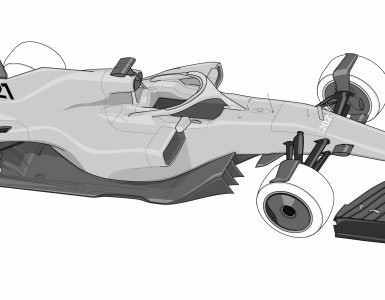 To achieve this sidepod design the side impact structures mounted to the tub and extending into the sidepod must be repositioned. Having changed the safety structures STR now have a high single inlet, with tidy vanes formed around the inlet and huge undercut below it. Also directing more airflow over the diffuser are the sloping surfaces of the sidepods directing airflow under the wide cooling outlet. These sidepod changes should really help generate rear downforce. More neat detail work around the middle of the car include Mirrors repositioned to suit the new rules, which then exploit the two allowable mountings to act as turning vanes. Additionally, the vertical sidepod vane is mounted like a “T” to the outer edge of the sidepod. As with the bargeboards, its likely this single simple vane will soon become much more complex. Underneath the rear bodywork is the updated Honda engine, the Manufacturer has made huge steps in performance and reliability last year, with promises of even more progress over the winter. While, Honda may still be some way behind Mercedes and Ferrari in overall power unit performance, it has closed the gap to Renault, and this will be important in the tight midfield battle that’s shaping up this year. Attached to the engine is the Red Bull gearbox, this is typical of current F1 gearboxes in that the entire gear cluster and differential is held within a self-contained ‘cartridge’, this then slots into carbon fibre outer casing. In recent years Toro Rosso merely took the gear cluster\cartridge and designed their own outer casing. This season they will take the entire rear end, including the cartridge, casing and rear suspension. This frees up the relatively small design team to focus on other areas of the car’s design, with STR still looking after its own cooling package and integration of the rest of the PU system, this will be a useful change for the team. 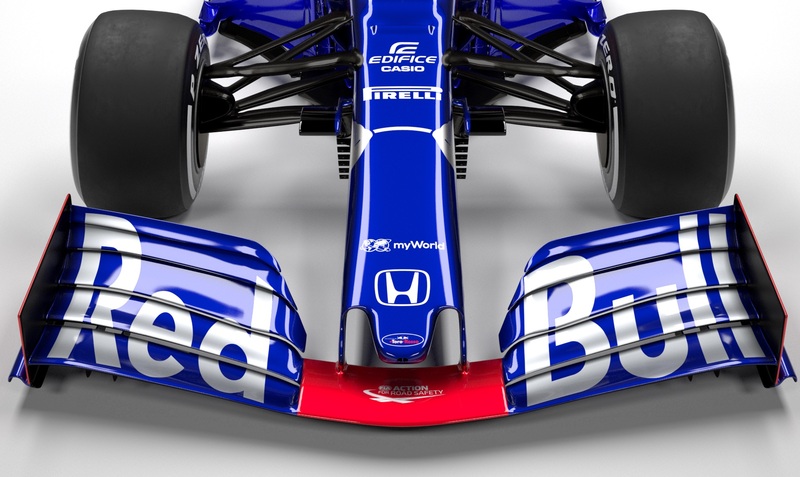 As with the bargeboards, a lot of the rear end detail appears simplified, so the slotted floor-edge treatment and rear wing endplate are more than likely going to change when the real parts are revealed. 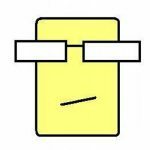 Looking at how the team will progress from a relatively poor performance in 2018, is going to be down to two things; Honda’s progress with its power unit and how Toro Rosso apply the greater resources freed up to develop the car. We’ll have to reserve judgement on Honda PU until the car takes to the track. But, from what visible on the car itself, there is a clear step forwards in design terms, but these steps are also likely to be taken by its rivals, so Toro Rosso will need to have more up its sleeve to push towards the front of the midfield in 2019. All images: © Red Bull Content Pool. 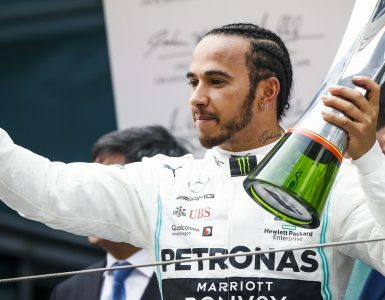 When you say ” This directs more airflow down around the sidepod to create more pressure over the diffuser.” do you mean increase the static pressure or increase dynamic pressure of the flow above the diffuser. And what is your reasoning for this improveing downfroce? I think it’s about the pressure gradient. you want high-pressure clean air above the diffuser ceiling and low pressure below the diffuser ceiling. This gradient generates downforce. so the sidepod design is to increase high-pressure air flowing above the diffuser at the coke bottle area, increasing the pressure gradient, increasing downforce. The diffuser is about increasing the static pressure, not directly generating downforce. The diffuser doesnt directly generate downforce, it expands the flow, decreasing velocity thus lowering dynamic pressure and increasing static pressure.